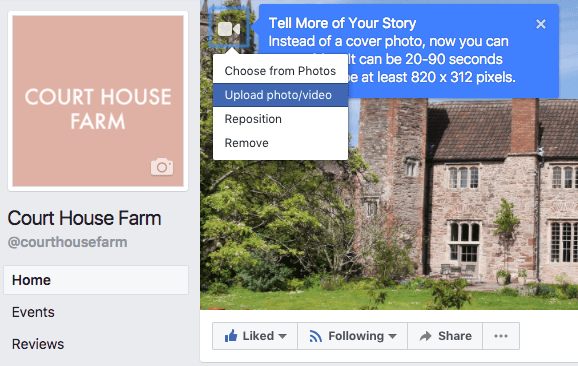 Facebook are slowly rolling out the function to add a cover video to your Business and Individual pages and we're excited to see how people will use them to engage audiences. We first spotted this update over on the Court House Farm Facebook page. The videos must be 20-90 seconds long and should be at least 820 x 312 pixels to comply. Glimpses from the catwalk. If you're a retailer, showcase your latest product in several snapshots. MTV cribs style! If you're a travel company, why not grab your audience's attention instantly with a glimpse into paradise? Get your audience asking where... and when they can book in to stay. Surprise. Go viral with a video that will encourage your audience to share and comment. We're not talking iMovie swipe effects, think Cinemagraph's that reveal your restaurant's environment. What's it like to be sitting there watching a live match at Wimbledon? Tease a clip of a new TV series just like Netflix's Narcos.